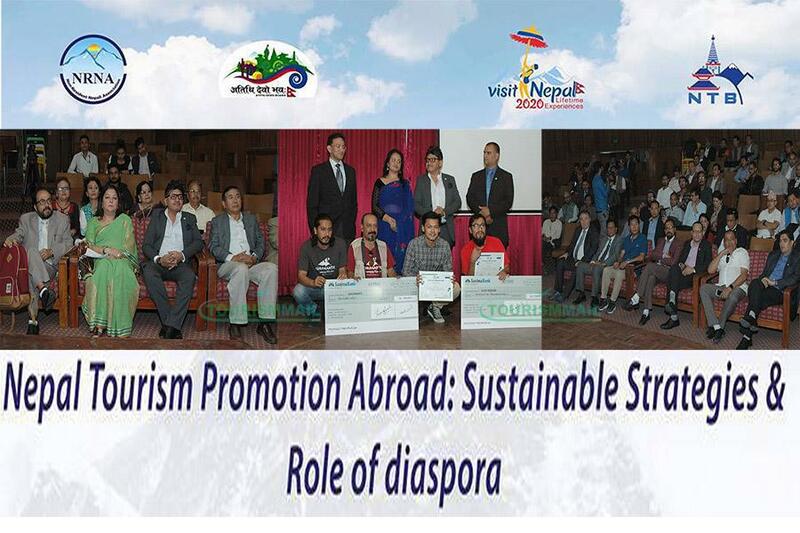 KATHMANDU, Oct 08: The Non-Resident Nepali Association and Nepal Tourism Board jointly coordinated a high-level interaction program on Nepal Tourism Promotion Abroad: Sustainable Strategies and Role of Diaspora on 8th October 2018, at Tourism Board office, Bhrikutimandap. In the program, Treasurer of NRNA, Som Sapkota highlighted the various promotional activities organized in Asian and European countries to promote Nepal in International Level. He also mentioned about the new ideas to promote Nepal and make Visit Nepal 2020 campaign successful. Speaking in the program, Deepesh Man Shakya, Coordination of Experience Nepal gave his emphasis on the exploration of sustainable strategies and stability in tourism sector. “We all should come up with various ideas plans should be made for long term. Until and unless we all will try to push our limits and promote Nepal in every possible manners we cannot bring tourists in Nepal. The major factor to increase the number of tourists is stability and sustainability” he said. Likewise, Bhawan Bhatta, President of NRN also announced about the upcoming Namaste Campaign to be organized to provide warm welcome to the tourists and give them positive message about Nepal. In the program, there was the presence of CEO of Nepal Tourism Board; Deepak Raj Joshi, General Manager of Turkish Airlines; Abdullah Tuncer Kececi, President of NRN; Bhawan Bhatta, President of TAAN; Navaraj Dahal, President of NATTA; CN pandey, Coordinator of Experience Nepal; Deepesh Man Shakya , Treasurer of NRNA, Som Sapkota and other tourism entrepreneurs.